The listings above are just a small sample of the popular diets advertised on TV, infomercials, and in books and magazines. Many are restrictive, and block out whole food groups. Over the years, I’ve tried many of them with varying success. Since most restrict either quantity, calories, or types of food, they are very hard to stay on for long periods of time. Your body is like a furnace. You need to keep the fire stoked and burning with the proper fuel for efficient operation. If you give it too little fuel, the fire goes out. If you give it the wrong fuel you may end up with a flash fire that quickly extinguishes or a heavy slow burning fire that lumbers along. Too much fuel and it has to store it somewhere. In simple terms, a furnace converts fuel into heat. If your body takes in more calories than it needs to function, it stores the excess by transferring it into fat. Many diets restrict so many calories, that the fire goes out. This causes the body to shut down its metabolism and go into starvation mode. Some diets severely restrict carbohydrates, which are the main fuel of the body This causes a very uneven fire which can make you lethargic and foggy. Other diets have you eating 2 or 3 big meals a day, which causes excess fuel to be stored as fat. So the real question is… How do you make your furnace burn the hottest? The secret to keeping the fire going is to eat smaller meals more often. This keeps the fire hot at all times and your metabolism steady. In practical application, this means 5 or more meals a day and 500 calories or less per meal. RULE 1: Eat more often. RULE 4: Move your muscles. 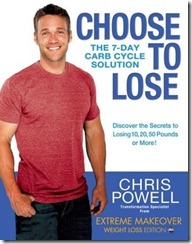 Chris has come up with a Carb Cycling program that can keep your body’s furnace burning hot at all times. His program has helped many overweight people find significant success. His story of how he helped David Smith lose over 400 pounds in 26 months is amazing. His video page will explain to you how this mysterious diet secret works and how true weight loss takes place. Years back, I used a similar plan (Body for Life) to lose 26 pounds in 12 weeks. I really like how Chris has fine tuned the diet portion and combined it with specific exercises to maximize how your body burns calories. In our next blog post, we’ll look at his carb cycling program and see how we can design a simple diet and exercise plan that will work with our busy lifestyles. Question: Have you heard of Carb Cycling?